Donald Trump during a meeting with members of the National Border Patrol Council at Trump Tower in New York on Friday. Let’s not naively insist on taking a wait-and-see approach regarding the events of the past 24 hours. The revelation of a tape from 2005 in which Donald Trump was caught making a number of lewd comments about women, and seemed to condone unwanted sexual contact toward women, is bad news for Trump. (#Analysis.) It’s not going to help Trump to become president in a country in which 53 percent of voters are women. The story has broken through the news cycle in a big way. Since Friday afternoon, Google searches for Trump are somewhere around four times as high as their already-insanely-high levels — in line with the sort of spike that usually occurs around a debate. But if we knew on Friday night that this would be a big story, it’s become an even bigger story throughout the day today (Saturday) as dozens of GOP elected officials have either repudiated Trump, or unendorsed him, or called for him to resign his position at the top of the ticket. Trump had unusually low levels of support from these “party elites” to begin with, but we’d usually seen only a few prominent Republicans repudiate him at a time after past controversies. Now, the floodgates have opened, and the whole party is fleeing him. We’ve never seen anything like this in a modern American election campaign. Republicans in 1996 may have given up on Bob Dole to concentrate on saving the Congress, but they weren’t calling for Dole to drop out 30 days before the election. My view of this general election — both how the FiveThirtyEight forecast models see the race and how I see it personally — is that it’s characterized by high volatility and high uncertainty. Those two things go together, although they’re not quite the same. But this is not a relatively newsless campaign like 2012, which was full of overhyped “game changers” that didn’t move the polls. Instead, there’s been a lot of news in 2016 — almost too much to comprehend or consume at once. That can make it hard for stories to metastasize. But when a story has broken through to dominate the news cycle, it usually has moved the polls in the direction that people expected. Trump’s feuds with Judge Gonzalo Curiel and the family of the American soldier Humayun Khan corresponded with periods when he declined in the polls. The first debate has turned into a disaster for Trump in a way that was fairly predictable based on instant-reaction polls. Trump’s convention was a mess, whereas Clinton’s was conventionally effective, and she got a much larger convention bounce. However, Clinton was hurt by her email scandal resurfacing as a major storyline in July. And she declined in the polls after her “basket of deplorables” comments and Sept. 11 health scare. So, to a first approximation, we’d expect the Trump tape to hurt him in the polls, particularly in light of the many GOP officials abandoning him. Many of those Republican defections are strategic rather than sincere, of course. If the news had broken when Trump was 5 or 6 percentage points ahead of Clinton instead of 5 or 6 points behind her, we probably wouldn’t see quite so coordinated and forceful a reaction. But the timing of this is just about as bad as possible for Trump. Even before the “hot mic” tape, there were reports that GOP elected officials might abandon Trump if he had a poor second debate. That makes sense, given that the Senate is still close to a toss-up and hasn’t made a definitive break in either direction. With one month left until the election, there’s perhaps just enough time for vulnerable Republican candidates to convince themselves that they’re better off abandoning Trump than sticking by him. Furthermore, the story comes in advance of the second presidential debate on Sunday and is likely to color both the substance of the debate and the reaction to it. And especially given that Trump had reportedly done little debate prep to begin with, it could lead to him going into the event off-balance. Maybe the debate will turn out OK for Trump. He’s certainly done a good job of — and I throw up a little bit in my mouth every time I use this phrase — lowering expectations. But given his perilous position in the polls, an OK debate wouldn’t be enough for Trump. He needs at least a good debate, and maybe a very good debate, since it represents one of his last and best opportunities to turn the race around. Now for the uncertainty part. As I said above, “this will probably hurt Trump” is a much better prior than “we don’t know what effect this will have.” But for now, I’m only willing to make a prediction about the direction (bad for Trump) — we’ll wait for the polls to measure the magnitude. Perhaps the most relevant piece of context, however, is that Trump was extremely unpopular to begin with. In our national polling average, he’s varied between having 36 percent of the vote and 41 percent and was at about 40 percent heading into the weekend. That’s awfully low for our modern, highly partisan era, in which all major-party nominees since 2000 have received at least 46 percent of the vote. 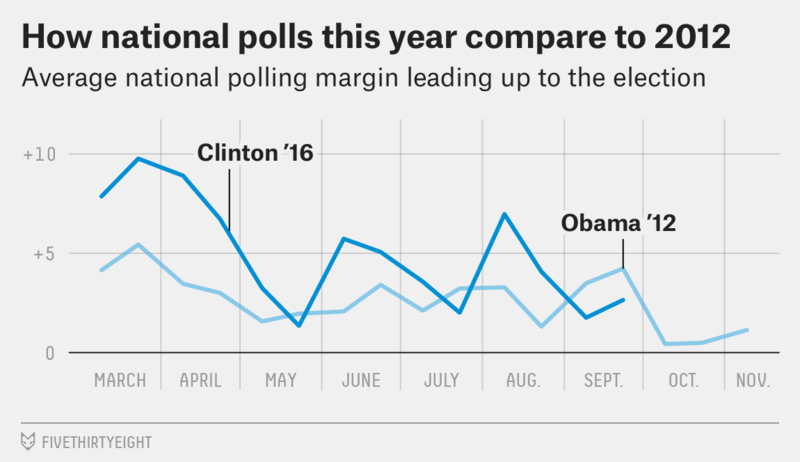 Clinton isn’t doing great either, but at about 45 percent in national polls, she’s closer to the normal range. True, both candidates also figure to pick up some undecided or third-party support and finish higher than their current raw numbers — but put a pin in that thought for a moment. On the one hand, the fact that Trump’s support was so low to begin with could presumably mitigate the damage to him. If you’re only getting 40 percent of the vote, the voters you do have are probably pretty committed to you — and Trump has some passionate supporters. On the other hand, the fact that Trump has only 40 percent of the vote means that the downside for him is awfully far down. What if he doesn’t win over any undecideds, and 40 percent turns out to be more of a ceiling than a floor? Trump’s unfavorable rating was approaching 60 percent even before the “hot mic” tape surfaced, which means he was already running into a headwind in terms of picking up additional support. Furthermore, he’s targeted a narrow slice of the electorate instead of a majority coalition. He doesn’t have much of a ground game to turn out his marginal voters, and, especially if he’s losing in the polls, they could decide that it just isn’t worth the time to vote. If Trump gets stuck at 40 percent of the vote, you could wind up with an outcome like Clinton 51 percent, Trump 40 percent, Gary Johnson 7 percent, Jill Stein and others 2 percent, or something of that nature. That is, a double-digit win for Clinton, which could potentially yield somewhere around 400 votes for her in the Electoral College, and make states as exotic as Texas and Alaska competitive. That outcome might seem far-fetched. But in an election with high uncertainty, it shouldn’t be. Even before the “hot mic” tape, our model gave Clinton a 5 to 6 percentage point lead, and the error in the forecast is roughly symmetric. The polls could move by 5 or 6 points toward Trump, giving him a narrow win, or — equally likely, per our model — they could move by 5 or 6 points toward Clinton, giving her a double-digit margin. To put it another way, a Clinton landslide is no more far-fetched than a Trump victory — and given the events of the past 24 hours, probably less so. We’ll have a longer article making a much more detailed version of this argument soon.